Quinoa & Vegetable Rolls. | Eat More Plants. I always do the nori (seaweed) on the outside and then a layer of quinoa, cauliflower rice or regular sushi rice. I used quinoa, carrot & cucumber noodles and avocado in my rolls today. I also noticed toasting the nori prior to using it lends a better flavor and a bit easier to slice through. Just hold it over a flame quickly on both sides until you see the green color lighten or toss it in the oven for 30 seconds at 250 degrees F.
I also used the leftover cucumber and carrot noodles as a salad on the side. Quick dressing of 1 teaspoon mellow miso paste, 2 tablespoons almond butter and enough lime juice to smooth it out. Always remember to taste and adjust as you go, especially with dressings and sauces. I had sushi out for lunch yesterday for the first time in a looooong time, over a year at least. It was good, and of course it’s nice to have somebody else deal with cooking and cleaning but I always like everything better homemade. 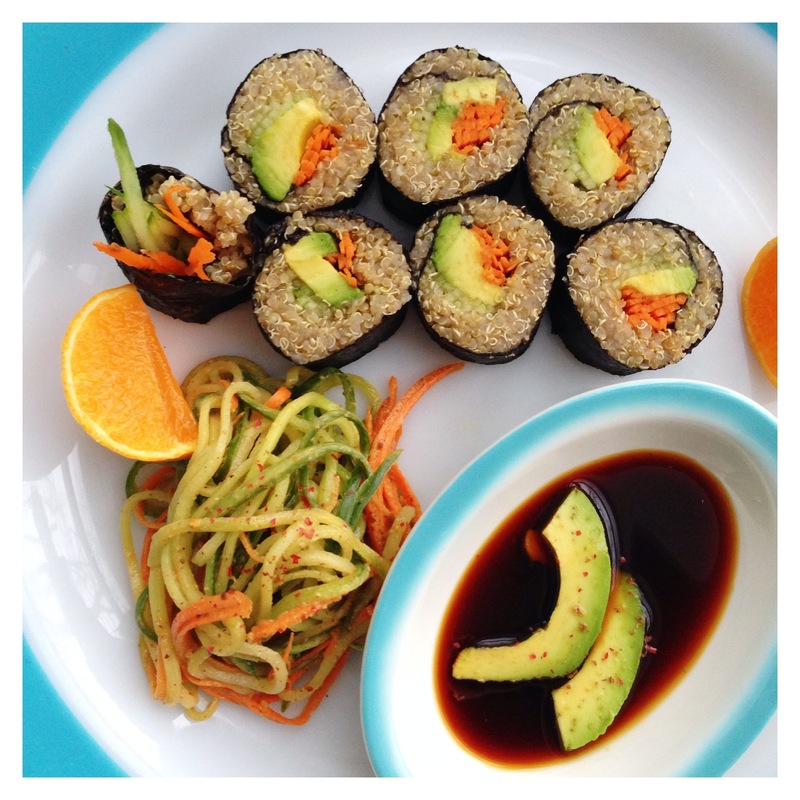 I have been dying to try making my own sushi – especially since it can be made out of quinoa!